Thank you! Thank you! 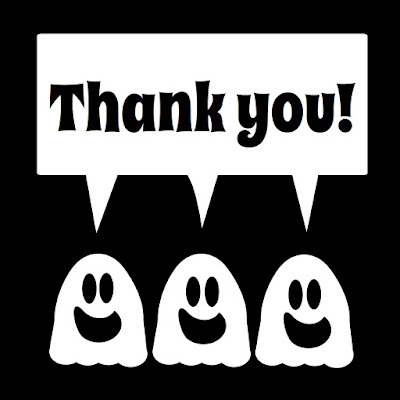 Thank you to everyone for supporting me during this Halloween season. It was my most successful yet! Special thanks goes out to Geauga County Public Library for hosting the Author Fair, Monroe's Orchard for hosting 3 Apple Festivals, Northern Ohio SCBWI for inviting me to the Self-publishing Rountable, Craddock Elementary School for inviting me to speak to all the second grade classrooms, Miller Elementary School for allowing me to read THREE GHOST FRIENDS for storytime in the library, Stephanie Mora for organizing a surprise preschool book order, Miss S for inviting me to read TGF BATTLE BOOS as mystery reader, everyone who bought one of my books, everyone who made my day by telling me that their child "loves my book", to all the children who told me "Your books are really good", my friends, family, and anyone else I may have forgotten.